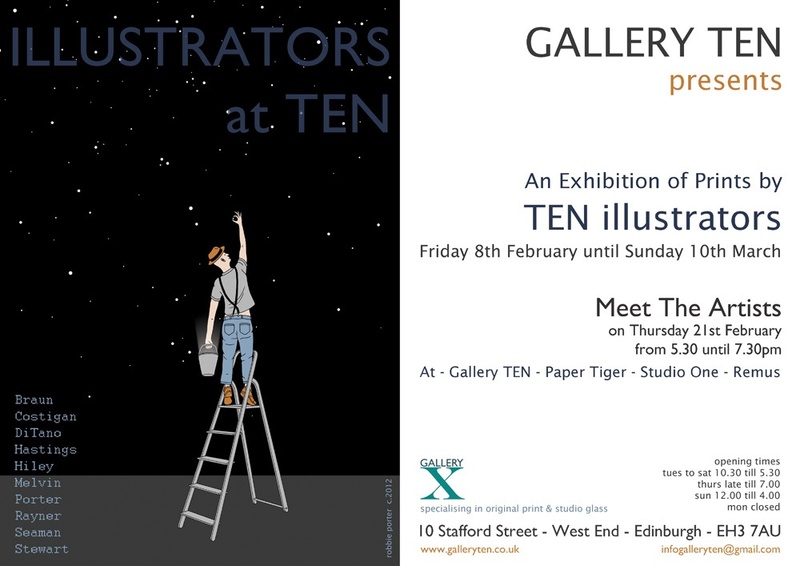 I’m a bit slow on the upkeep with posting news of this new exhibition, titled ‘TEN’, as it’s ten illustrators all exhibiting under the one roof. It’s a beautiful gallery space, located directly above Studio One on Stafford Street. 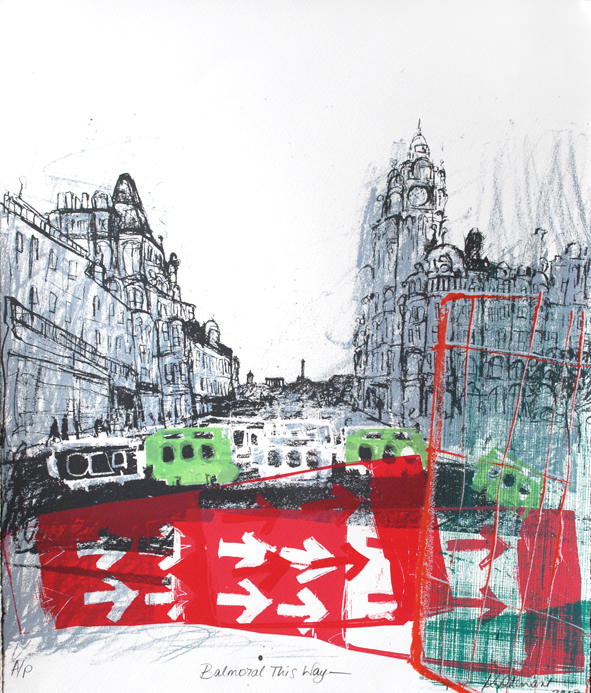 This is a fabulous opportunity to check out what started as a ‘pop up shop’ idea by a couple of printmakers at Edinburgh printmakers Workshop. 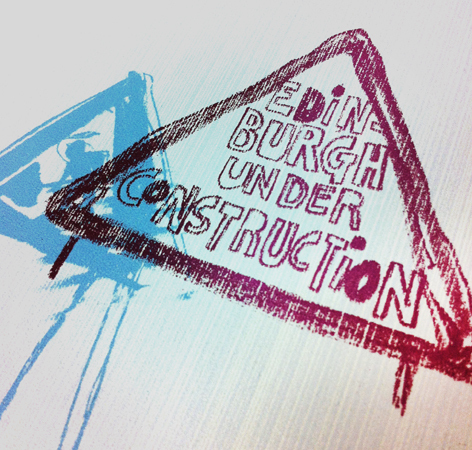 There have been a few temporary exhibitions held in various locations in Edinburgh previously under the name of ‘Spectrum’, but this is more of an ongoing venture. Great to see motivated people making a difference! Reams of the stuff, it was soooo much fun! So last year when I heard it would be an illustration exhibition I decided to pull out an idea that had been lurking under the surface for well over a year now. All of those around me know it as the ‘construction series’. 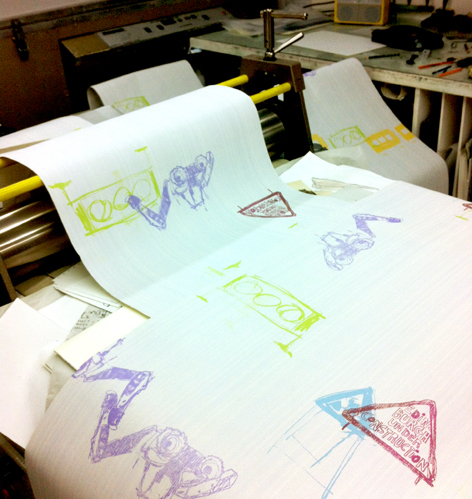 It started to unfold at last year’s festival when I screenprinted 20 metres of construction subect matter as my backdrop. Included was witches hats (cones), trucks, signs and brightly coloured banners/fences. It was a way of bringing some humour to my exhibition space, essentially being the backdrop to my predominantly Edinburgh cityscape pieces. note the interesting textures from printing onto the wall paper, wow! So I felt it was about time that I unleash the construction series, so it can be included in the illustration exhibition on Stafford Street. I began to work on 6 designs at the one time, experimenting with monotone backdrops and colourful foregrounds, as well as positive and negative space. 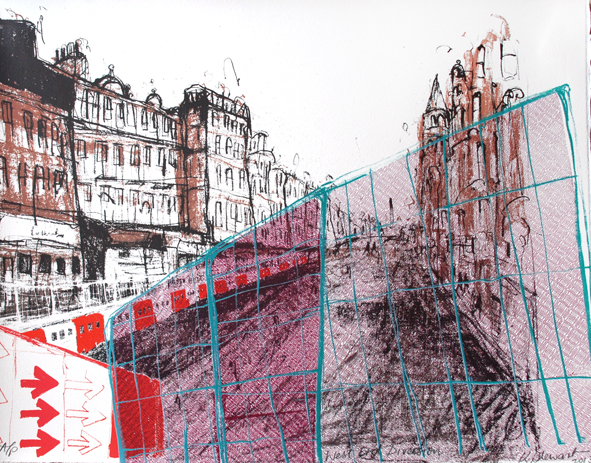 I can’t tell you how much I enjoyed screenprinting the coloured mesh right across my almost finished print….it’s exactly what it’s like when you see the mesh on the streets of Edinburgh, it casts a texture and colour like coloured glasses. When working on the pieces I realised that it’s actually the West End where I had taken the majority of my 100+ photos of the works over the past year or so. Quite apt i thought quietly to myself. Then I delivered the works to the gallery with a little hesitation as I was unsure how people would respond. Considering no one has discussed the weather ever since the tram works started, there’s no doubt that it would conjure up the built up frustration that we all feel, to say the least. Low and behold the Scotsman newspaper also wanted to know more. I can see why artists focus on the flavour of the month, because word spreads quickly, but I appreciated the opportunity to express my viewpoint on why I did the construction series. Here is the link to the article below. Many of the statements in the article are not entirely correct, for starters I’m described as a Scots artist…..surprising considering it was a verbal interview. That’s the newspaper, never believe everything you read. I am still to finalise the last couple of prints, however I do have a couple of the artist proofs, which are slight variations on the edition.